One of my favorite features of the new home under construction at Eagle Summit, is that we expanded a small mudroom off the kitchen into a larger room. This room will allow for not only mudroom cubbies, but also a large desk along one wall (or even two) plus lots of flexible open space. It’s going to be perfect for crafts, sewing, homework or whatever else your family needs. Imagine having all your kids’ homework organized and easily at hand, instead of sprawled all over the kitchen table or piled on a counter. Can you picture it? Here’s just a few ideas I’ve compiled, showing how the lucky new homeowners might use this space. 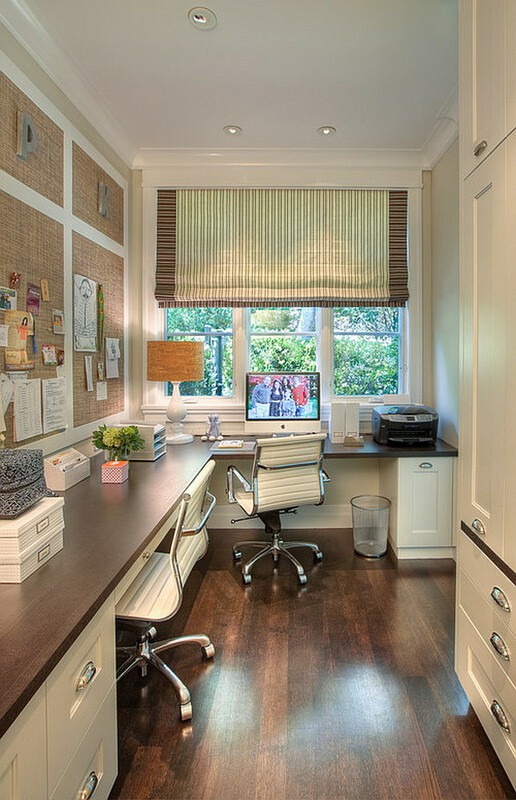 This home office/craft room by Sunny Side Up features beautiful built in cabinetry. Based on the photo, this room is about the same size as the one in the Eagle Summit Home, and the window location is even a match! This is pretty much exactly what I had in mind when I designed the floorplan. Another idea based on a home office, this space by Polsky Perlstein Architects opts for lower cabinetry with open space above for display. Those mats would be a great place to pin up upcoming work projects, homework assignments or your kids’ latest artwork. This simple IKEA hack by Icing on the Cake creates a great work space with open storage. Plus I love the chalkboard wall. Finally, here’s an image from Better Homes & Gardens that every mother would love to see in real life; two kids quietly and peacefully working on their homework. It might be just a dream, but I like to think this dedicated homework space *might* someday make it a reality. What do you think of having a dedicated space for crafts or homework that’s located off the kitchen? How would you use that space? For yourself? The kids? You can see more ideas and inspiration on my Pinterest page. Plus stay tuned for updates on this new home under construction in Lehi!